Kids, grass, juice, wine and more. Some really great things can make some really big messes. But now it is easier than ever to say goodbye to these unsightly stains in your laundry. Introducing an all natural bleach alternative and stain fighter to make the chore of doing laundry quick and simple. Xtra Clean is specially formulated to be tough on stains, but gentle on your skin and the environment. Use it with every load to brighten colored fabrics and whiten whites. It will deep clean and remove stains more effectively than traditional methods. Add just a scoop to a normal sized load for best results. It can even be used directly on clothing for really tough, set-in stains. You will notice a difference even after the first load. Your clothes will be brighter and stain free. This all-natural solution is safe for the most sensitive skin, people with allergies and even babies and infants. Use it as part of a total non-toxic laundry solution. Now it is even easier to keep your clothes looking like new, and do it without harsh chemicals. Xtra Clean works so well it comes with a 100% satisfaction guarantee. Xtra Clean is made from natural ingredients and contains no toxic chemicals, cleaning solvents, or harmful abrasives. It mixes with ordinary water and uses the tremendous cleaning power of oxygen to remove stains. Oxygen is released immediately upon contact with water. It goes to work right away, targeting stains, rather than the fabric, and removing them with ease. It works great on clothing, carpet, and other water washable surfaces. It won't damage surfaces or fabrics and is environmentally friendly. Despite being safe and natural, Xtra Clean is extremely powerful and will remove stains and make your clothes look and smell cleaner than ever. Natural enzymes and active oxygen combine to keep whites white, and colors bright. Remove stains and brighten fabrics with this easy-to-use laundry additive. Xtra Clean is safe to use on any washable fabric, and is chlorine-free, making it a healthy and safe alternative to chlorine bleach. Add just a scoop to a load of wash to remove stubborn stains and brighten clothing. It deodorizes as it cleans, leaving your clothes super clean, and smelling fresh. Xtra Clean is biodegradable, and contains no phosphates. Use it with confidence on children's clothes, for people with allergies, those with sensitive skin, or any one else interested in a safe, easy and effective way to deep clean laundry. This laundry additive meets all environmental protection criteria which means that it is safe for you and your planet. Now you can have clean, fresh, odor-free laundry without irritation. Need to tackle stains outside of the laundry room? Xtra Clean can be used for over 101 stains on multiple surfaces like carpet, upholstery, kitchen and bath surfaces and even works outdoors on gutters, unfinished decks, and patio furniture. Use it in your laundry or as an excellent cleaner to remove food and grass stains, blood, mold, mildew, urine and more. 100% chlorine-free! Order Yours Today! Xtra Clean - An all-natural alternative to traditional laundry boosters and bleach. It is free of harsh chemicals, and safe for people with allergies. Remove tough stains with ease. Just one scoop is all it takes! This particular item is the best item when used with the liquid QnB product for laundry -- I wet stains (even mustard) with the liquid and rub the XTRA-CLEAN into the stain -- letting it sit for about an hour and then was with my regular detergent in the hottest water possible and it just works wonders! 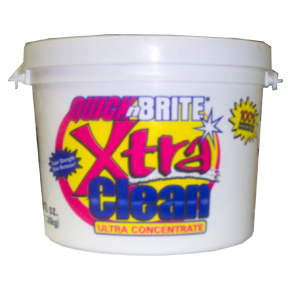 What is the difference between Xtra Clean and Liquid Quick n Brite?? Is there a difference in ingredients?? These two products are actually very different, and they do not share the same ingredients. Xtra clean is a white, granulated powder, and the concentrate is a thick, pink liquid. Xtra clean is a laundry additive that acts like a safe bleach and stain fighter, and the regular liquid is an all purpose cleaner that can be used as a detergent substitute, but also for hundreds of other cleaning jobs. 16 of 17 Customer(s) found this Answer helpful. When using Xtra Clean for laundry, do you use it with your regular detergent or by itself? It is intended as a booster. You may be able to use less detergent, but you will still need some detergent when adding xtra clean to your wash. This product is a laundry additive. For cleaning leather clothing and furniture, you should try Quick N Brite Paste. For cleaning cabinets and other wood surfaces, you'll want the regular Quick N Brite Paste. What is the best product for cleaning burned on soot off a fireplace?